The following centers and websites host, display or provide assessment platforms for carbon cycle science data and tools from different sources and ecosystems at diverse spatial and temporal scales. Please note that the content on this page originates from the original (hyperlinked) sources with minimal editorial changes. The NACP includes diverse projects and activities. Agencies fund projects led by Principal Investigators (PI) through grants or contracts (extramural) as well as by identifying funding for government laboratories or research centers (primarily intramural). Agencies also commit activities within standing programs to address NACP goals and objectives or to supply specific measurements or data sets for NACP. Additionally, the NACP draws on numerous research programs and data sources that are not involved directly in the program and that have primary missions or goals that differ from those of NACP. Thus, the NACP requires flexible criteria for designating participating projects and investigators. CCIWG members and agency program managers designate projects and investigators within their areas of responsibility as official participants in the NACP based on broad guidelines defining core and affiliated projects. If your project meets the criteria, you may submit your project for consideration to be included in the NACP. This data set provides environmental data that have been standardized and aggregated for use as input to carbon cycle models at global (0.5-degree resolution) and regional (North America at 0.25-degree resolution) scales.The data were compiled from selected sources and integrated into gridded global and regional collections of climatology variables (precipitation, air temperature, air specific humidity, air relative humidity (NA only), pressure, downward longwave radiation, downward shortwave radiation, and wind speed), time-varying atmospheric CO2 concentrations, time-varying nitrogen deposition, biome fraction and type, land-use and land-cover change, C3/C4 grasses fractions, major crop distribution, phenology, multiple soil characteristics, and a land-water mask. 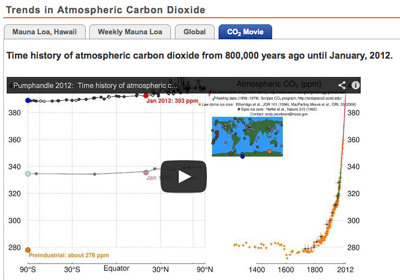 The driver data are sufficient for carbon cycle model simulations from 1801 to 2010. The temporal resolution ranges from 3-hourly for climate to monthly for CO2-atm and phenology to annual for N-deposition and landcover.These data were compiled specifically for the North American Carbon Program (NACP) Multi-Scale Synthesis and Terrestrial Model Intercomparison Project (MsTMIP) as the prescribed model input driver data (Huntzinger et al., 2013). The driver data were used by 22 terrestrial biosphere models to run baseline and sensitivity simulations. The standardized data provided consistent model inputs to minimize the inter-model variability caused by differences in environmental drivers and initial conditions. Together with the sensitivity simulations, the standardized input data enable better interpretation and quantification of structural and parameter uncertainties of model estimates. 44,833 samples were collected from the upper 1 meter of 32,084 soil profiles at 6,017 randomly selected locations for measurement of organic and inorganic carbon by visible and near infrared (VNIR) spectroscopy and bulk density by traditional methods. NRI sites were used as the basis for random selection of sample sites stratified by soil group within RaCA Region and land use/land cover (LULC) within soil group. Soil morphology and landscape characteristics were described at each site and limited vegetation and agricultural management information was collected from each location. Sample collection and analysis involved more than 300 soil scientists and assistance from 24 universities.Reference: Soil Survey Staff. Rapid Assessment of U.S. Soil Carbon (RaCA) project. United States Department of Agriculture, Natural Resources Conservation Service. Available online at http://soils.usda.gov/survey/raca/. 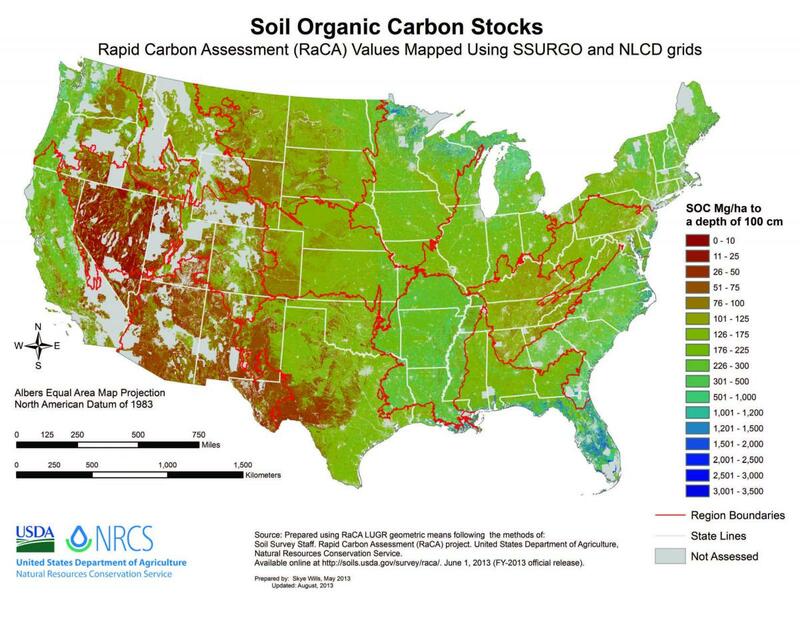 June 1, 2013 (FY2013 official release).To develop statistically reliable quantitative estimates of amounts and distribution of carbon stocks for U.S. soils under various land covers and to the extent possible, differing agricultural management. The vulnerability of coastal areas to rising sea level. CDIAC is located at DOE's Oak Ridge National Laboratory (ORNL) in Tennessee. The International Soil Carbon Network (ISCN) is a scientific community devoted to the advancement of soil carbon research. The Network coordinates independent soil research and monitoring efforts in the United States and internationally. ISCN members contribute to a community-driven soil carbon database and use available data to prepare scientific papers and large-scale syntheses.Overarching these goals is the need for a spatially explicit approach, since measurements of soil C storage, turnover, and vulnerability all vary at spatial scales from several meters to thousands of kilometers, as well as across different depths within an individual soil profile. In addition to database development, modeling, and mapping, the Network also facilitates topical workshops, peer-reviewed publication, and presentations at professional conferences. The Global Monitoring Division of NOAA/Earth System Research Laboratory has measured carbon dioxide and other greenhouse gases for several decades at a globally distributed network of air sampling sites [Conway, 1994]. A global average is constructed by first fitting a smoothed curve as a function of time to each site, and then the smoothed value for each site is plotted as a function of latitude for 48 equal time steps per year. A global average is calculated from the latitude plot at each time step [Masarie, 1995]. Data are reported as a dry air mole fraction defined as the number of molecules of carbon dioxide divided by the number of all molecules in air, including CO2 itself, after water vapor has been removed. The mole fraction is expressed as parts per million (ppm). Example: 0.000400 is expressed as 400 ppm. At the “Surface Ocean CO2 Variability and Vulnerability” (SOCOVV) workshop at UNESCO, Paris in April 2007, co-sponsored by IOCCP, SOLAS, IMBER, and the Global Carbon Project, participants agreed to establish a global surface CO2 data set that would bring together, in a common format, all publicly available fCO2 data for the surface oceans. (The fugacity of carbon dioxide, or fCO2, is the partial pressure of CO2 (pCO2) corrected for non-ideal behaviour of the gas.) This is an activity that has been called for by many international groups for many years, and has now become a priority activity for the marine carbon community. This data set will serve as a foundation upon which the community will continue to build in the future, based on agreed data and metadata formats and standard 1st level quality-control procedures, building on earlier agreements established at the 2004 Tsukuba workshop on “Ocean Surface pCO2 Data Integration and Database Development”. This activity also supports the SOLAS and IMBER science plans and their joint carbon implementation plan. The EPA Greenhouse Gas Reporting Program (GHGRP) is a relatively new program that collects detailed emissions data from the largest greenhouse gas emitting facilities in the U.S. 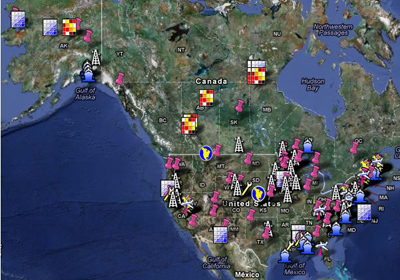 While the Inventory provides high level perspective needed to understand the United States’ total emissions or “carbon footprint,” the GHGRP provides the detailed information that helps us better understand the sources and types of greenhouse gas emissions at individual facilities. This information can help industry identify opportunities for reduction and help communities identify nearby sources of greenhouse gas emissions. This data can be used to compare facilities or industries, track emissions from one year to the next, inform policy at the state and local levels, and provide important information to the finance and investment communities. Data from these two programs can be used to answer common questions about U.S. greenhouse gas emissions. For example, the Inventory could help users find the contribution of the transportation sector, or the power sector, to total U.S. greenhouse gas emissions. The Greenhouse Gas Reporting program could help users find the biggest stationary sources of greenhouse gas emissions in a region. This is a whole farm and ranch carbon and greenhouse gas accounting system. The tool guides you through describing your farm and ranch management practices including alternative future management scenarios. Once complete, a report is generated comparing the carbon changes and greenhouse gas emissions between your current management practices and future scenarios.